Kaveri @ low cost. 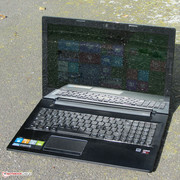 The IdeaPad Z50-75 is available for a low 400 Euros (~$501) without a Windows operating system. The buyer gets a quad-core processor, dual-graphics solution from AMD, and a 1 TB hard drive. An irresistible bargain? 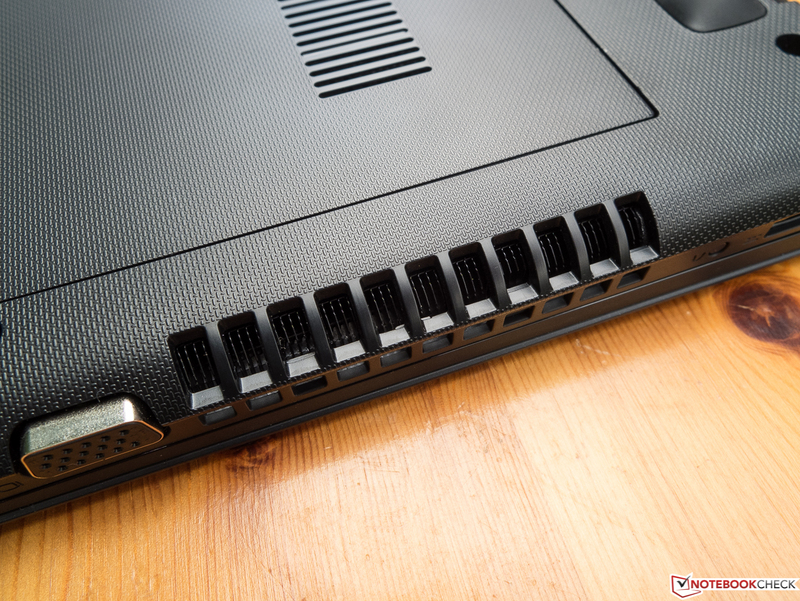 We tested the Z50 in the form of the Z50-70 (Core i7-4510U, GeForce 840M) only a few weeks ago. Now we have our hands on the Z50-75 sister model equipped with AMD technology. A quad-core processor and dual-graphics solution are inside. With a price of 450 Euros, ~$564 (400 Euros, ~$501, without Windows operating system), the Z50-75 is almost 300 Euros (~$376) cheaper than the Z50-70. Our report reveals whether the Z50-75 can compete with Intel's counterpart. The IdeaPad is a member of the below 500-Euro (~$627) all-rounders. Many rivals are found in this sector, such as Acer's Aspire E1-572G (Core i5-4200U, Radeon HD 8750M) and Medion's Akoya P6647 (Core i5-4200M, GeForce 825M). The Akoya configuration that we tested is considerably more expensive than its contenders with a price of approximately 600 Euros (~$752). However, the laptop is available with a Pentium 3550M for a price starting at 480 Euros (~$602) in an entry-level version. 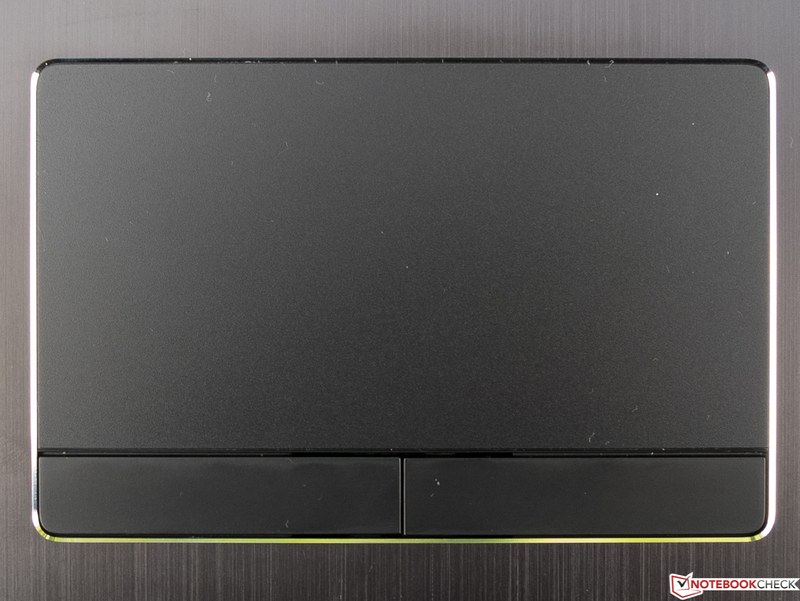 Since both IdeaPads feature an identical build, we will not go in-depth about casing, connectivity, input devices or speakers. 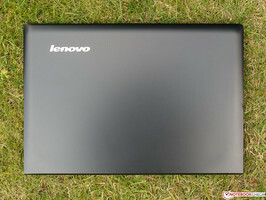 The corresponding information can be found in the review of the IdeaPad Z50-70. 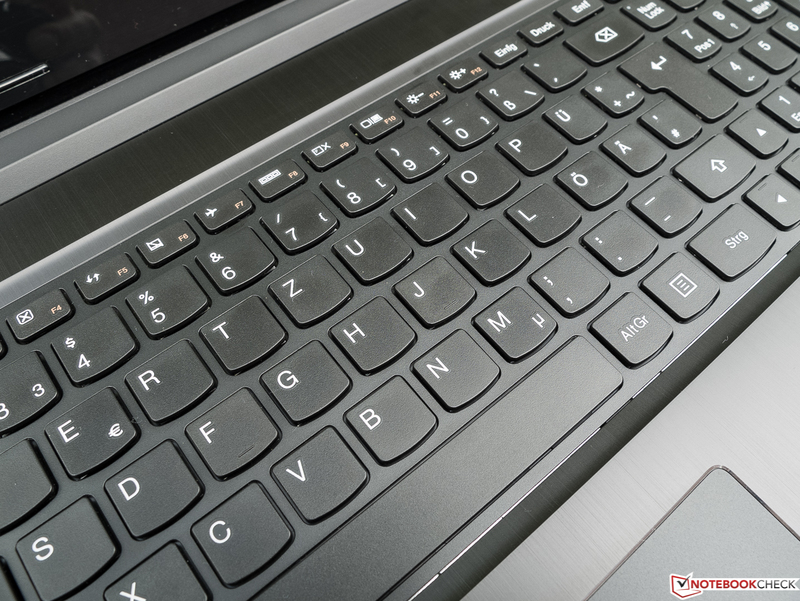 There is then a slight difference between the IdeaPad Z50-75 and Z50-70: While the display's back of the Z50-70 features a smooth surface, the Z50-75 has a rippled structure. 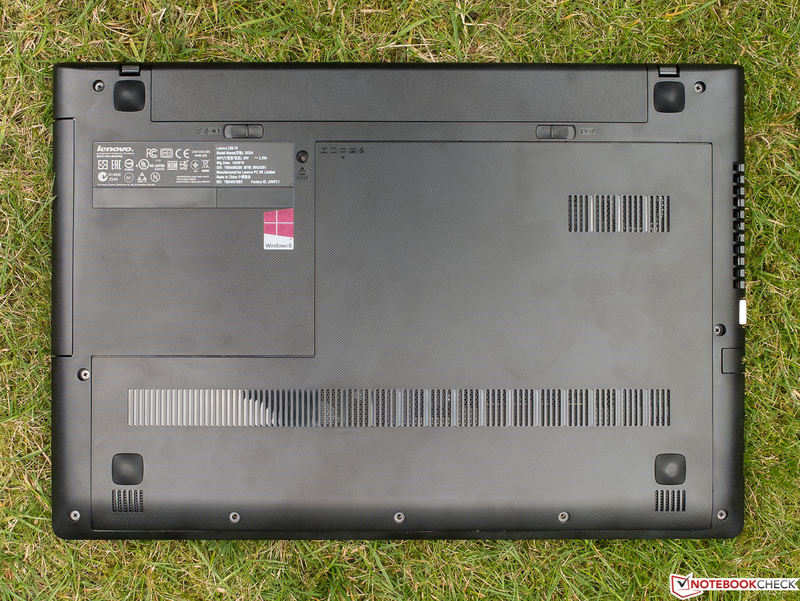 In contrast to the Full HD screen in the IdeaPad Z50-70, an HD screen (1366x768 pixels) is installed in the Z50-75. That is also the reason why the Z50-70 costs roughly 300 Euros (~$376) more than the Z50-75. 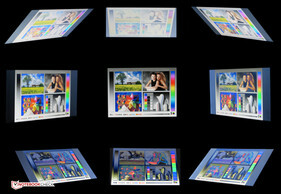 The HD screen operates with a brightness of 223.9 cd/m². Although this is not a good rate, it is acceptable in view of the laptop's price. The screens of the Z50-70 (192.3 cd/m²) and Aspire (182.3 cd/m²) achieve lower rates. However, the Full HD screen in the Akoya (290.1 cd/m²) is pleasing. Both the contrast of 536:1 and black level of 0.42 cd/m² are also absolutely satisfactory. 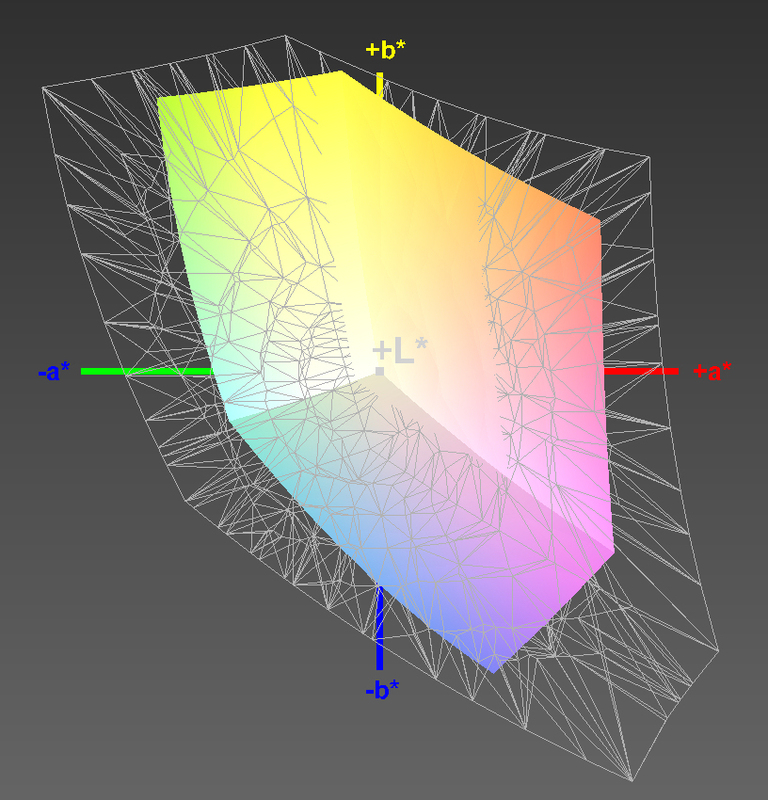 The screen in the Z50-70 (546:1, 0.37 cd/m²) provides similar rates. Both the Aspire (415:1, 0.47 cd/m²) and Akoya (399:1, 0.8 cd/m²) do a slightly worse job. The IdeaPad's screen cannot reproduce either the AdobeRGB or sRGB color spaces. The coverage rates are 39% (AdobeRGB) and 56% (sRGB). The average DeltaE 2000 shift is 11.6 in state of delivery. This rate is normal for laptops from this price range. Ideal would be a rate of less than 3. The screen also exhibits a clear bluish cast. 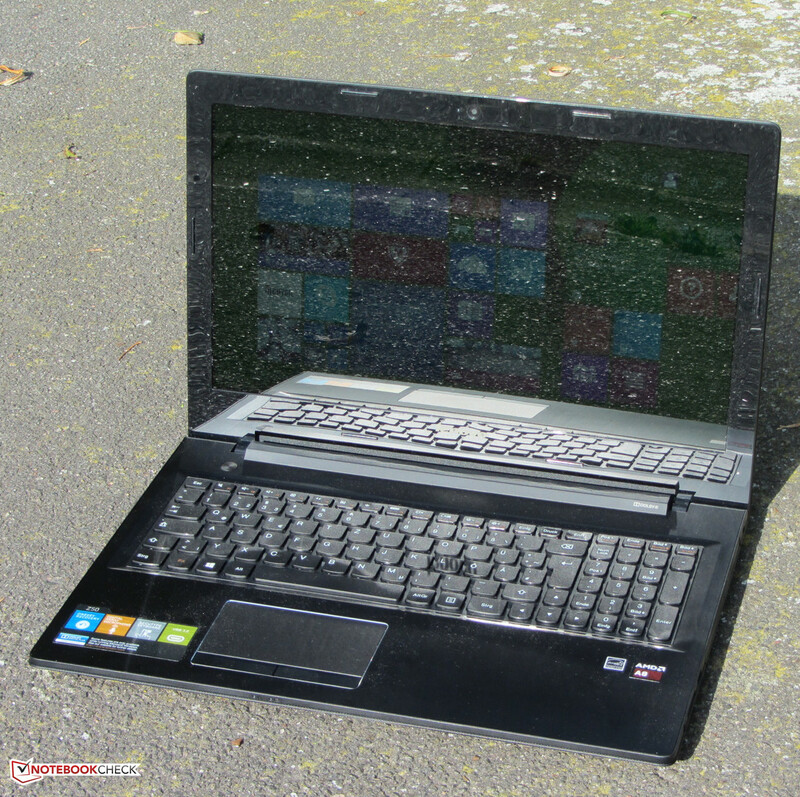 The IdeaPad is equipped with a simple TN screen, and thus it can only offer limited viewing angles. We did not expect anything else considering the price. Even the considerably more expensive IdeaPad Z50-70 does not have a viewing-angle stable IPS screen. 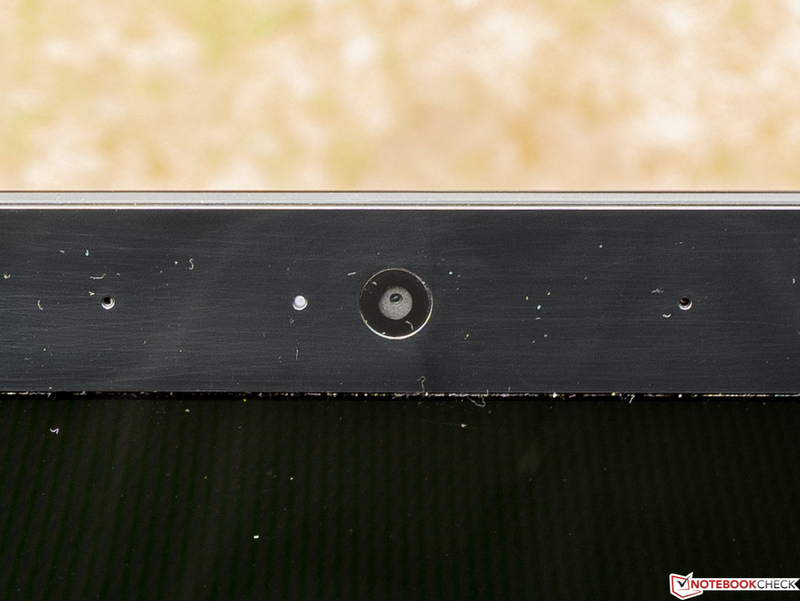 The screen's highly reflective surface also makes reading the screen outdoors extremely difficult. Consequently, outdoor use is only possible in shadowy places. 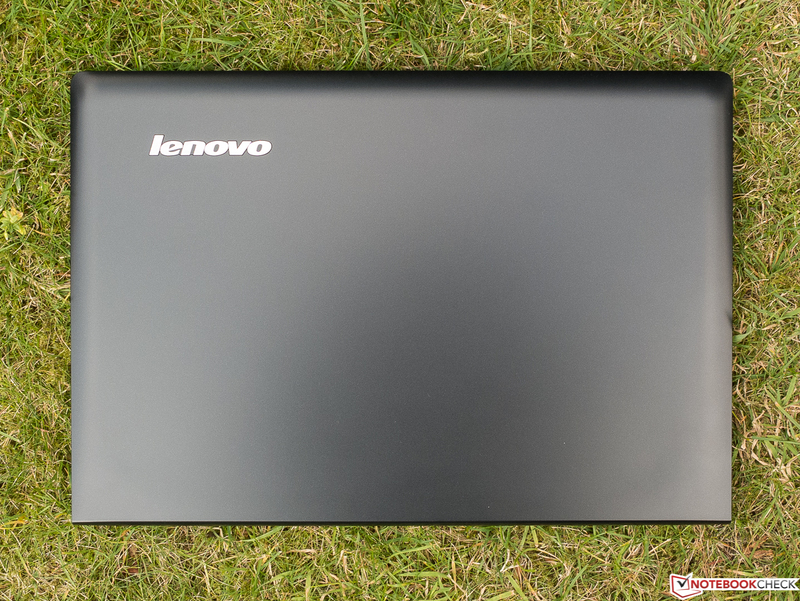 Lenovo's IdeaPad Z50-75 is a basic all-round laptop. It not only has enough computing power for routine applications but can also smoothly render computer games to a limited degree. Our review sample is available for approximately 450 Euros (~$564) or 400 Euros (~$501) without a Windows operating system. 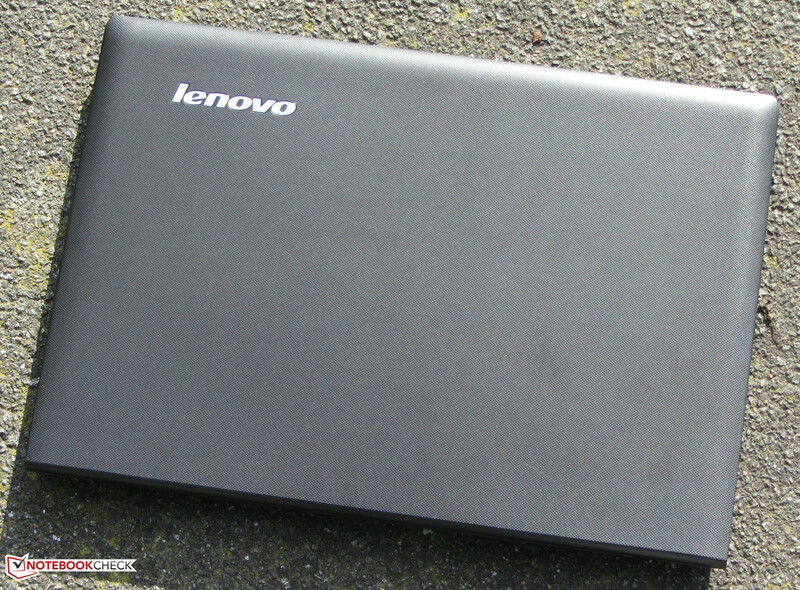 Lenovo has multiple other models in its IdeaPad Z50 lineup. 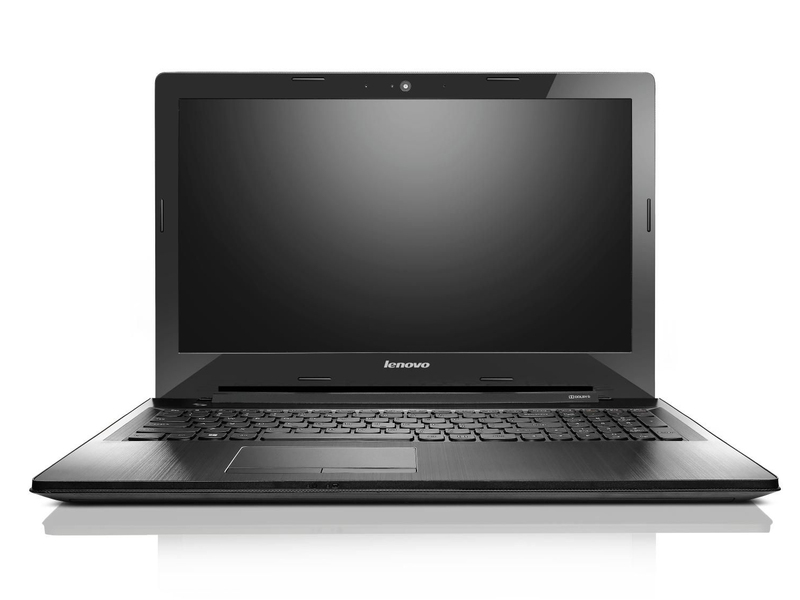 Lenovo installs an A8-7100 APU (Kaveri) from AMD in its IdeaPad. The processor part of the APU clocks with a base speed of 1.8 GHz. It can be accelerated up to 3 GHz via Turbo. The processor is comprised of four CPU cores. The APU's TDP is 19 watts. Additional information and benchmarks relating to AMD's Kaveri APU can be found in our corresponding article. We could not retrieve the APU's full processing power. The processor performed the single-thread tests of the Cinebench benchmarks with 2.1 to 2.5 GHz, and the multi-thread tests with 1.6 to 1.8 GHz. 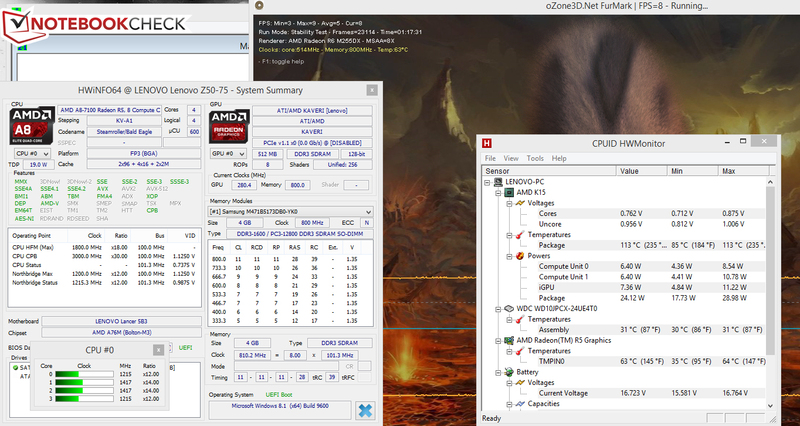 The APU ran both tests with a consistent 1.8 GHz in battery mode. The multi-thread scores are roughly on par with those of current Haswell Core i3 ULV processors. If the processor could retrieve its full performance, the scores would likely be on the level of the Haswell Core i5 ULV processors. The processor cannot compete with Intel's Core i3 processors in the single-core performance. It is on par with the Haswell Pentium ULV CPUs. The system generally runs smoothly. However, we could not perform some of our benchmarks. The 3DMark05 and 06 benchmarks crashed right in the middle of testing with error messages. The programs presumably have problems with the dual-graphics. 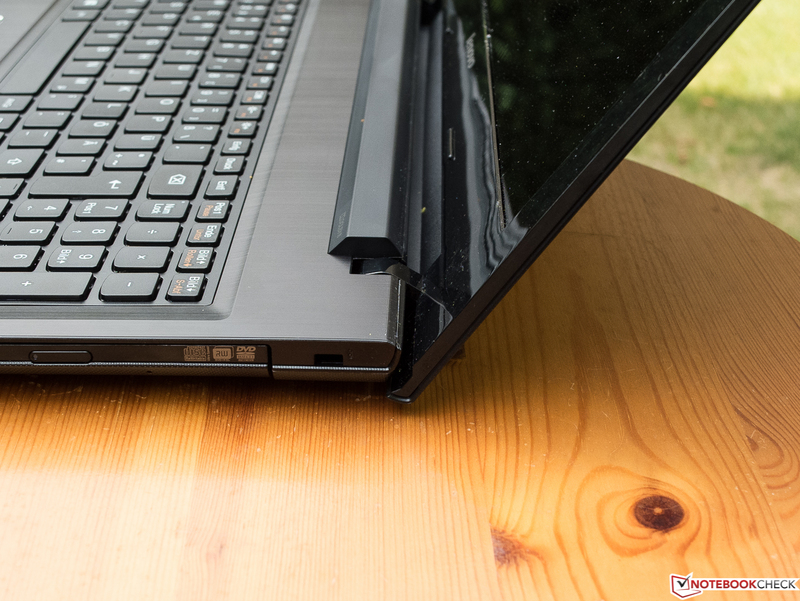 The PCMark 7 and 8 benchmarks caused the laptop to freeze. 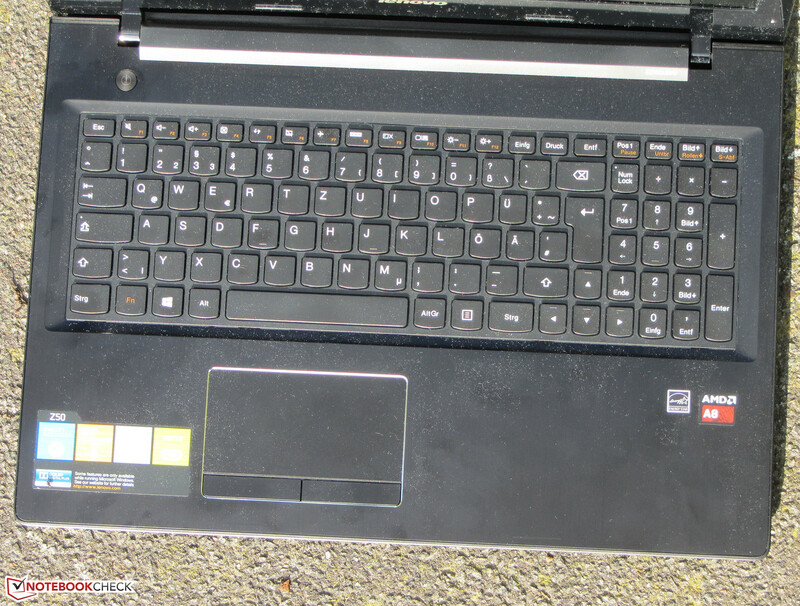 The laptop first smoothly performed PCMark 7 after we disabled the dual-graphics in the BIOS. This action did not have any effect on the behavior of the PCMark 8 benchmark. 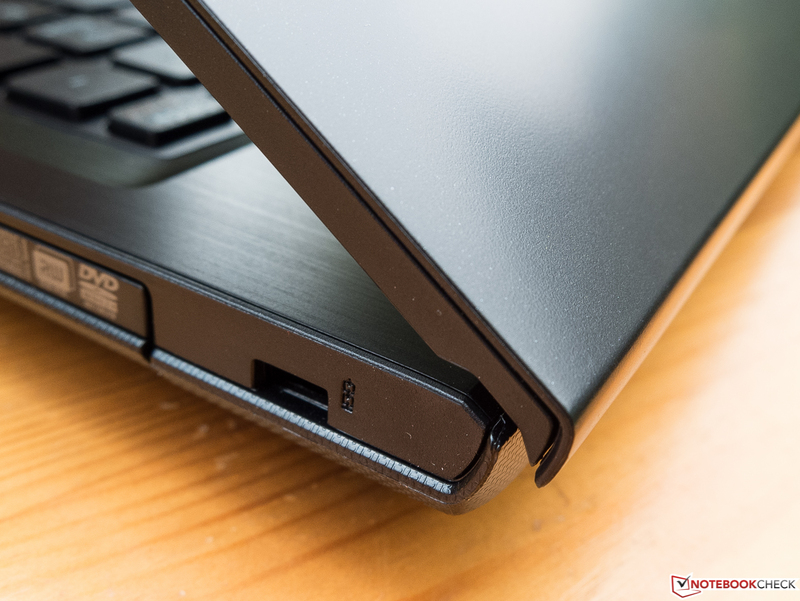 Owners of an IdeaPad will not run out of storage space very soon. The installed hard drive from Western Digital offers a storage capacity of 1 TB. It spins with 5400 revolutions per minute. CrystalDiskMark recorded a read speed of 101.9 MB/s, and HD Tune delivered an average transfer rate of 84.3 MB/s. 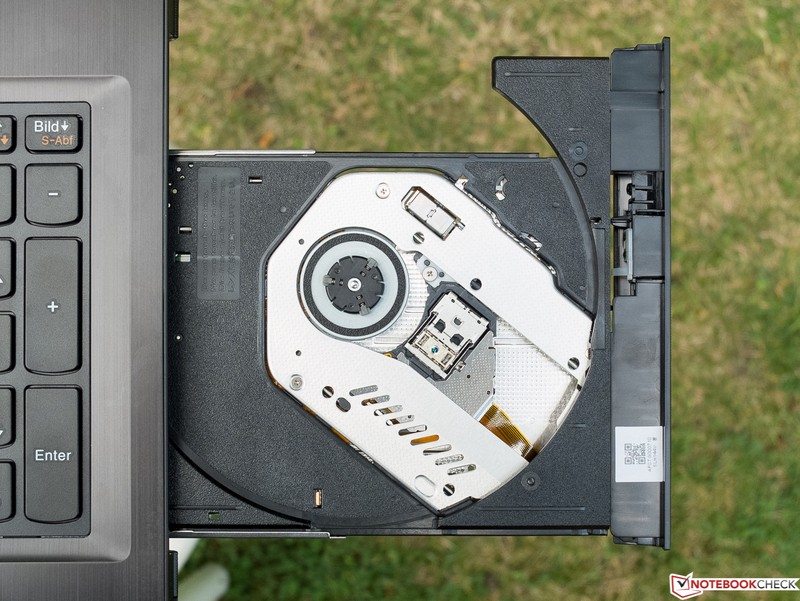 Thus, the drive is on par with virtually all currently available 5400 rpm hard drives. 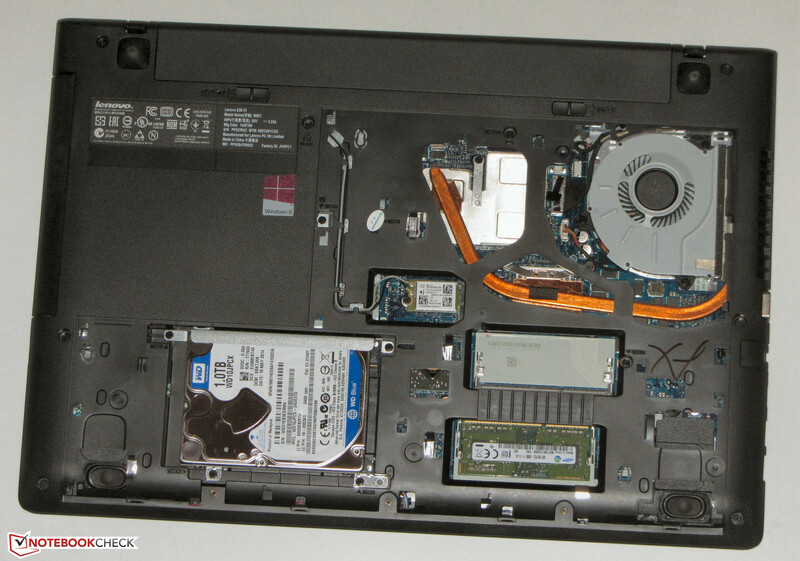 The Radeon R6 M255DX graphics solution is installed in the IdeaPad. It is not a dedicated graphics chip, but a dual graphics solution from AMD. It is comprised of the integrated Radeon R5 (Kaveri) graphics core and the dedicated Radeon R5 M230 GPU. The GPUs operate in a so-called Crossfire array, i.e. 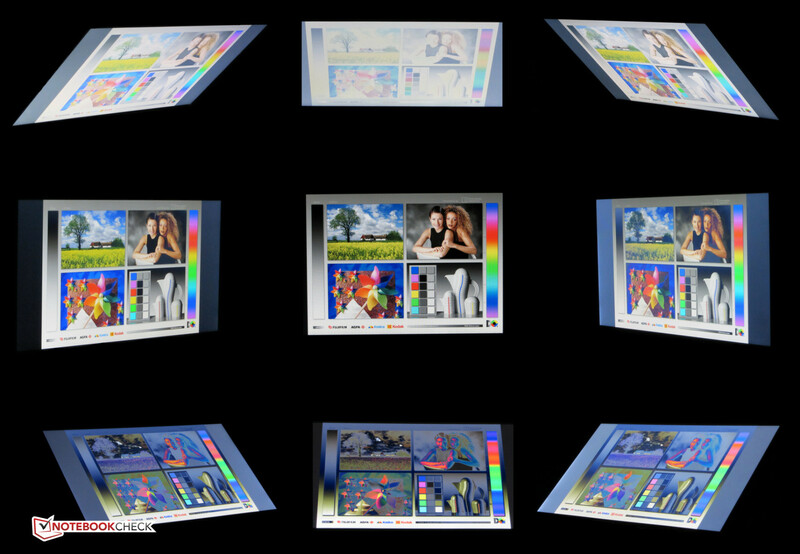 both cores can perform the calculation of displayed images. This process is, for example, used in computer games. Only the integrated GPU is used for routine tasks and in battery mode. The user can determine whether single applications are to be performed with the dual-graphics solution in the driver menu. There is no general performance advantage over a dedicated Radeon R5 M230 GPU. The scores and frame rates clearly increase in some benchmarks and games, and in other cases there is no difference. The R6 M255DX graphics solution sometimes reaps in a lower score. Just looking at the 3DMark 2011 benchmarks scores indicate that the performance of the installed graphics solution should roughly be on par with a dedicated Radeon HD 8750M GPU. The gaming benchmarks did not confirm this. 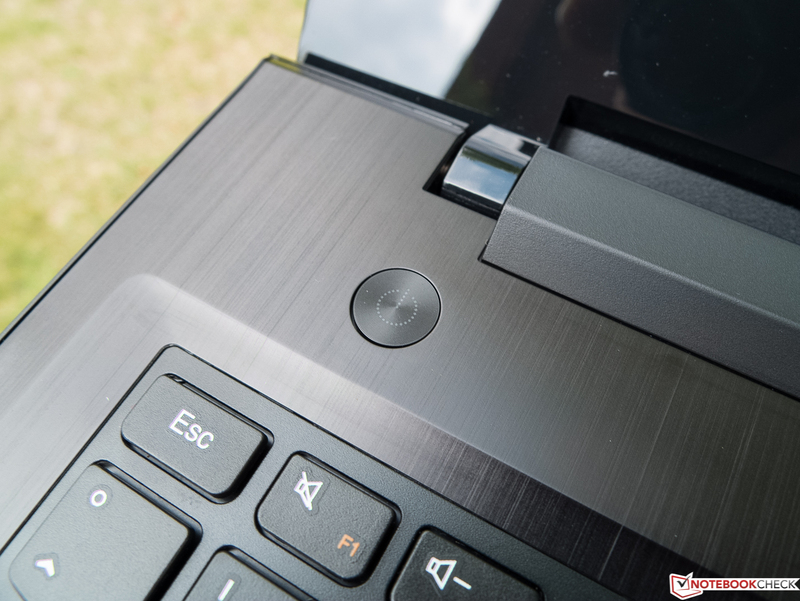 The IdeaPad rarely, if at all, comes close to a correspondingly equipped laptop. The Z50-75 managed to render most games in a low (to sometimes medium) resolution and low (to sometimes medium) quality settings smoothly. Therefore, it is likely that something will happen in some games in the future providing the drivers are optimized accordingly. The Radeon R6 M255DX graphics solution supports AMD's Mantle interface, and we tested the game Thief with and without Mantle. The frame rates averagely climbed by 23.6% to 18.4 fps (min. ), 13.1 fps (med. 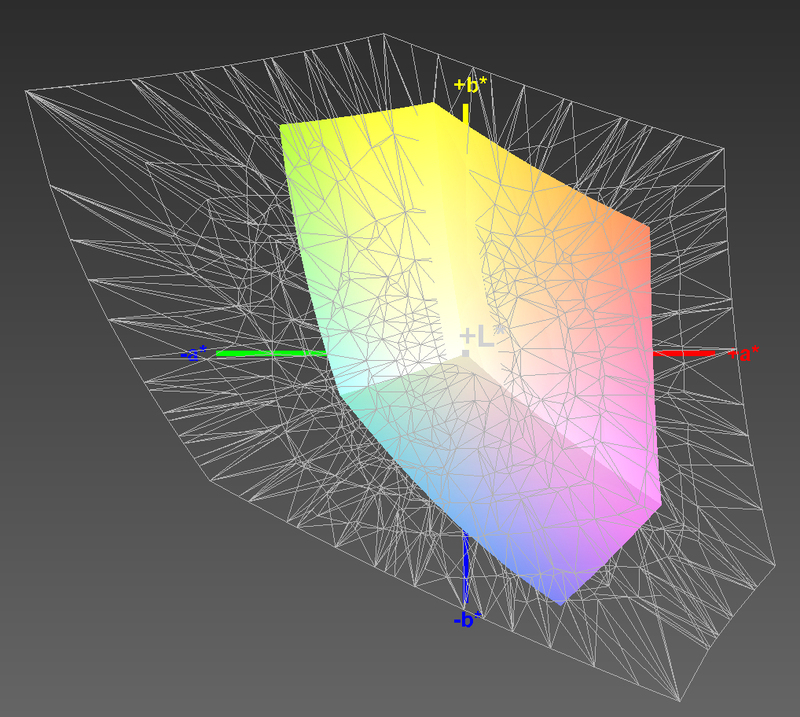 ), 10.1 fps (high) with enabled Mantle. Battlefield 4 also supports Mantle. However, the tool fraps refused to record the frame rates when the Mantle interface was enabled. Consequently, we cannot provide any results for this game. Buyers looking for an affordable, gaming-suitable laptop will find considerably better alternatives in the 400 to 500 Euro (~$501 to ~$627) price range. 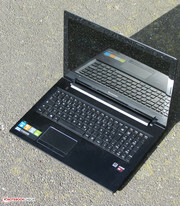 For example, the Aspire E1-572G (Core i5-4200U, Radeon HD 8750M). This device is now available for 470 Euros, ~$590 (or 400 Euros, ~$501, without a Windows operating system). Also, entry-level versions of the Akoya P6647 (Core i5-4200M, GeForce 825M) are available for below 500 Euros (~$627). The fan spins at a low speed with a quiet, consistent noise in idle mode. The fan does not get exceedingly loud during load either. We measured almost equal noise levels of 37 dB(A) during medium load via 3DMark06 and 36.2 dB(A) during full load in the stress test via Furmark and Prime95. That is not surprising since the processor was throttled during the stress test. It overall looks identical in the Aspire; the Akoya produced more noise during load. The GPUs performed the stress test (Prime95 and Furmark run for at least one hour) in the same manner in both AC and battery modes. While the integrated GPU clocked with 200 to 300 MHz, the dedicated GPU ran at full speed (855 MHz). The CPU clocked with 1.2 to 1.4 GHz in AC mode and 1.1 GHz in battery mode. 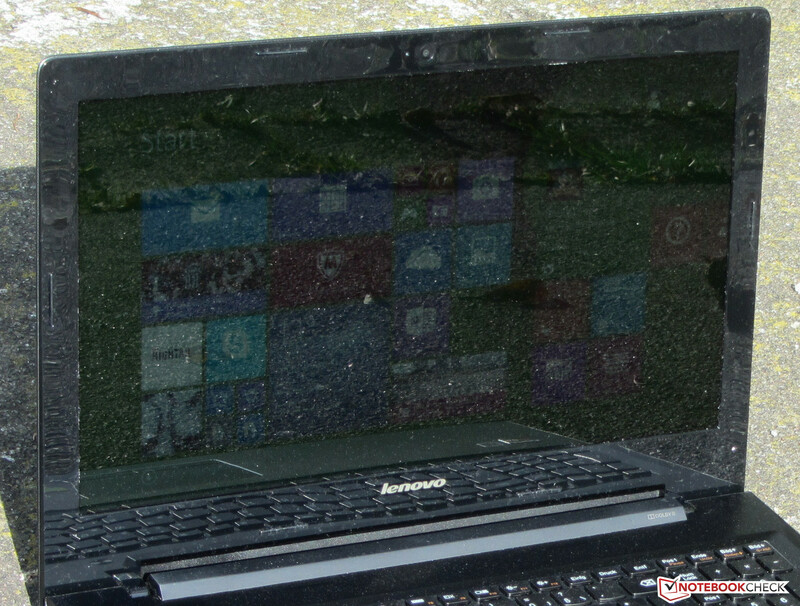 The IdeaPad does not struggle with heatwaves. We measured a maximum temperature of 40 °C on one measuring point even during the stress test. The CPU's throttling is noticed here. Both the Aspire and Akoya reach higher temperatures. (+) The maximum temperature on the upper side is 39.5 °C / 103 F, compared to the average of 36.5 °C / 98 F, ranging from 21.1 to 71 °C for the class Multimedia. The idle power consumptions of the IdeaPad and Aspire are identical. The Akoya consumes more power because it is equipped with a standard mobile processor (no ULV). The three comparison devices basically range on a similar level during load. However, the IdeaPad consumed the least power in the stress test because the laptop's CPU is throttled strongly. The battery in the IdeaPad lasted for 5:11 h in idle mode. The Aspire (9:02 h) achieves a considerably better runtime. Idle mode is ascertained using Battery Eater's Reader's test. The screen is set to its minimum brightness, the energy-saving profile is enabled, and the wireless modules are off. The IdeaPad shut down after 1:14 h in load. The Aspire (1:20 h) is on par with that. The load runtime is determined with Battery Eater's Classic test using maximum screen brightness, the high-performance profile, and enabled radio modules. 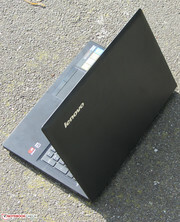 The IdeaPad closed the Wi-Fi test after 2:35 h. The Akoya (3:26 h) and the Aspire (4:26 h) last longer. Websites are automatically opened every 40 seconds using the energy-saving profile and a screen brightness of approximately 150 cd/m². We test the video playback time by running the short movie Big Buck Bunny (H.264 encoding, 1920x1080 pixels) in a loop. The energy-saving profile is enabled, the radio modules are disabled and the screen's brightness is set to approximately 150 cd/m². The IdeaPad lasted for 2:20 h here. In total, the IdeaPad serves with abysmal, no longer contemporary battery runtimes. 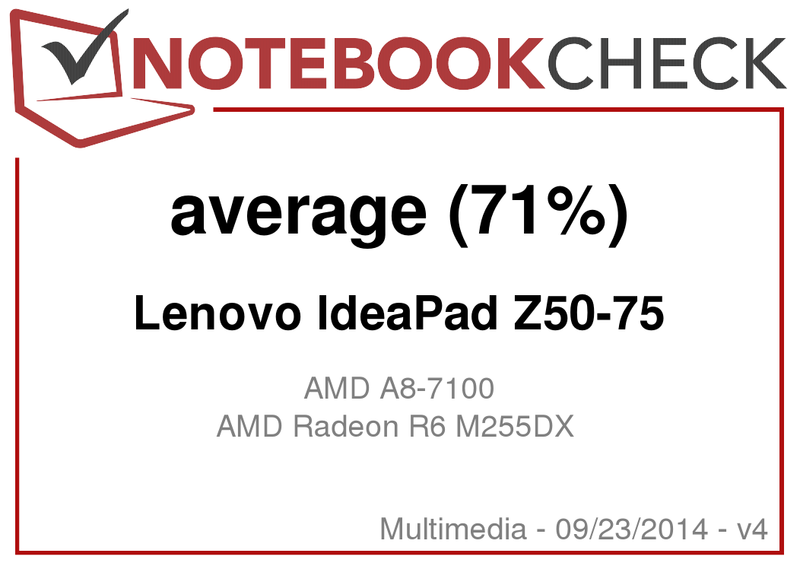 The IdeaPad Z50-70 sister model achieved twice the runtime in most of our battery tests. That is, however, not least due to the Z50-70's higher battery capacity (41 Wh) in contrast to the Z50-75's (32 Wh). Lenovo's IdeaPad Z50-70 is an affordable 15.6-inch all-round laptop. The installed quad-core processor provides enough power for applications from the office and Internet fields. Furthermore, it is possible to play some computer games. The gaming performance should satisfy casual gamers. 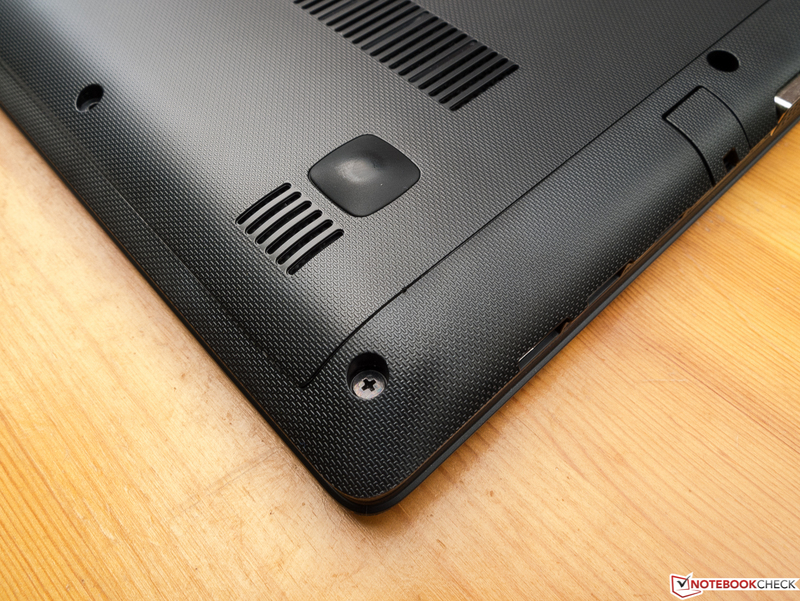 The IdeaPad always operates quietly and barely heats up. Accessing the hardware is no problem owing to the big maintenance cover. The screen will not win any awards but is acceptable in view of the laptop's price. The poor battery runtimes have to be reproached. We are accustomed to these rates from multimedia laptops based on Core i7 processors and premium-range graphics cores. 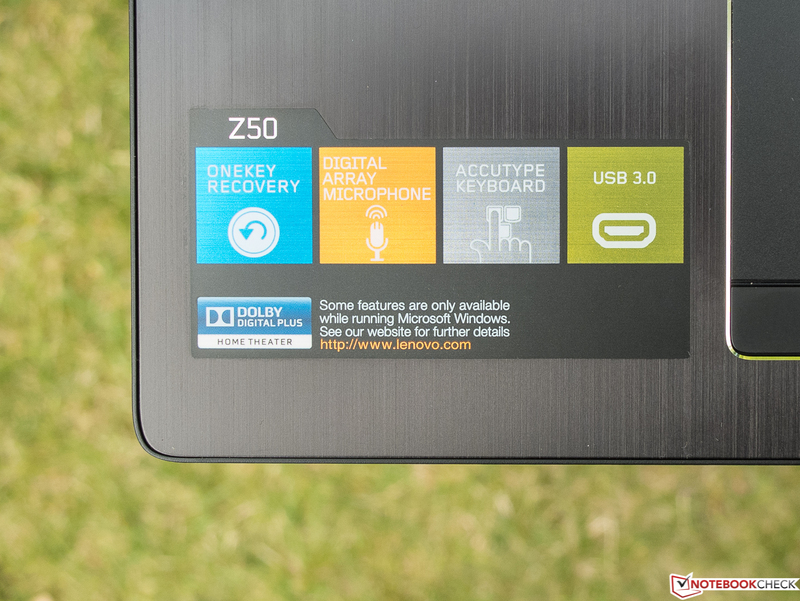 In our opinion, the Z50-75 will have a hard time finding buyers because there are better laptops in this price range. 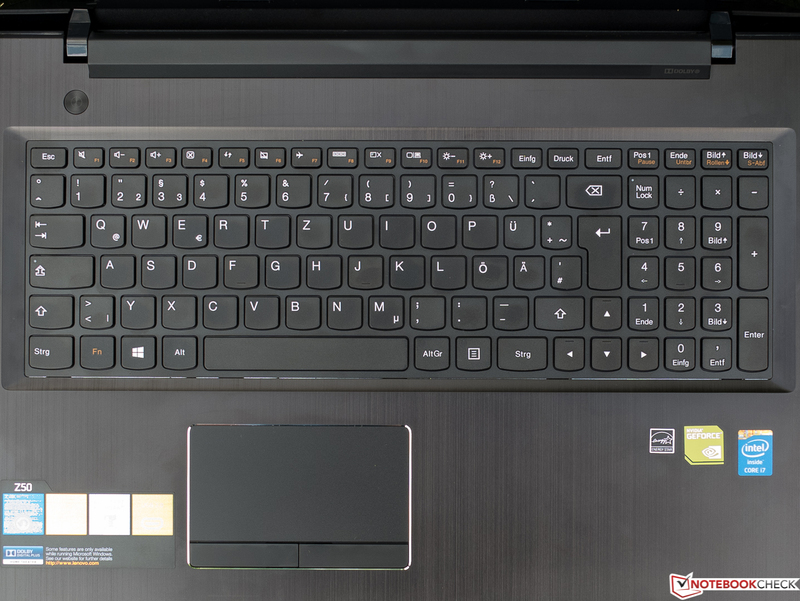 We would like to mention the Aspire E1-572G here. It offers more CPU performance, more gaming power, longer battery runtimes, and a matte screen. The display lid features a rippled texture. ...keep the lid firmly in place. The lid's maximum opening angle is approximately 130 degrees. 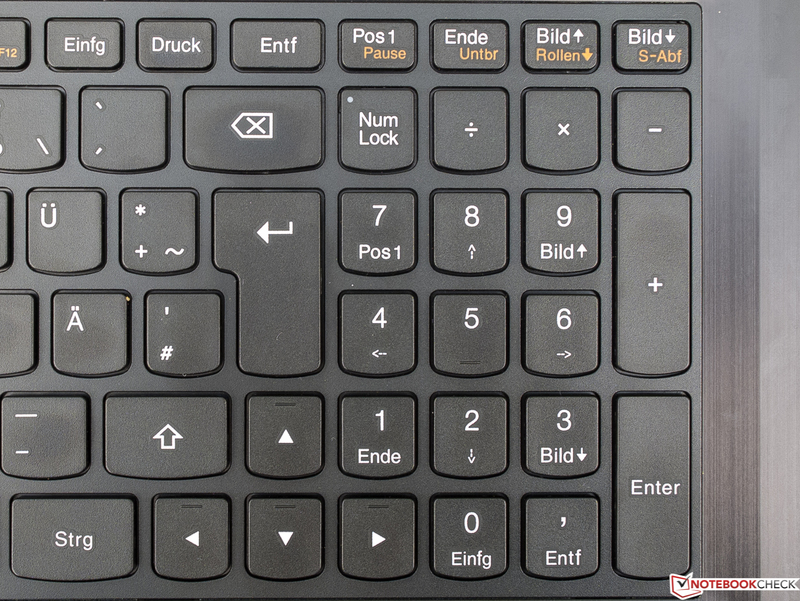 Lenovo's typical AccuType keyboard is on-board. The small orange-colored lettering of the FN keys is barely perceptible. The touchpad is encircled by a silver bezel. The DVD burner read and writes all kinds of DVDs and CDs. Three screws secure the maintenance cover. The hardware can be accessed after removing the cover. The quiet operating noise and low heat development. Lenovo ships the Z50-75 with a battery that has a lower capacity than the model included for the Z50-70. Medion Akoya P6647, Acer Aspire E1-572G, Asus X555LN-XO112H, HP Pavilion 15-p008ng, Dell Inspiron 15-5547, Acer Aspire E5-551-T8X3, Lenovo G510, HP Compaq 15-a024sg, Lenovo IdeaPad Z50-70.